A Dusting of Sugar: Seahorses! Did you know seahorses can't curl their tails backwards? And that they graze constantly and can consume more than 3,000 brine shrimp per day? My sister told me this bread looked like a seahorse. I guess? But the tail has to curl forward! Obviously she knows nothing about seahorse anatomy. I've been feeling very domestic lately. I want to cook a big meal and wear a cute apron. I want to have a dinner party. Can I feed you? Please? Shape the dough into a ball and place in a greased bowl turning to coat to rise for about 90 minutes, or until double in size. 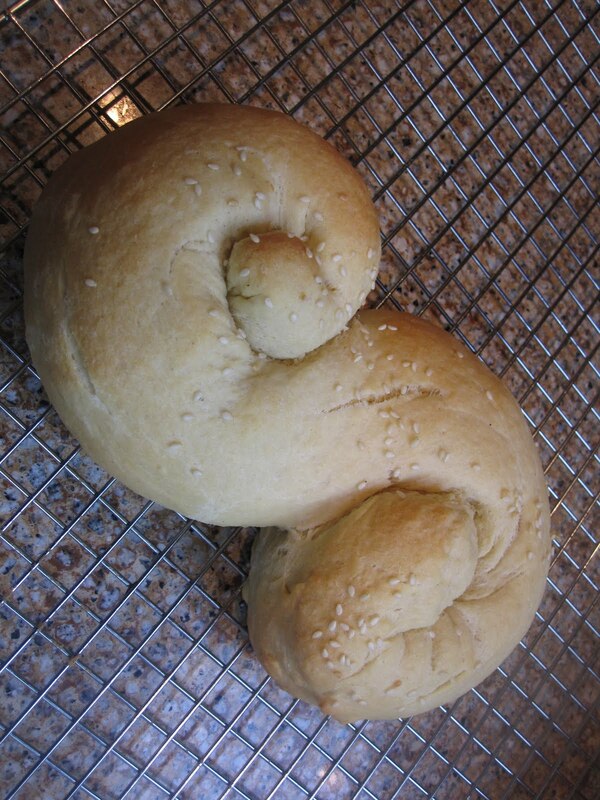 Gently deflate the dough and divide it in half. Shape each half into an 18 inch long rope. Working with one piece of dough at a time, mark the center of the rope and coil the end to the center. Coil the other end to make an “S” shape. Place the loaves on a parchment-lined or lightly greased baking sheet, and cover lightly with greased plastic wrap and set aside to rise for an hour, or until they are nice and puffy. Toward the end of the rise time preheat the oven to 350ºF. Brush the loaves with the egg wash and sprinkle with sesame seeds. Bake for about 25 minutes or until golden brown. Remove from the oven and cool on a rack.